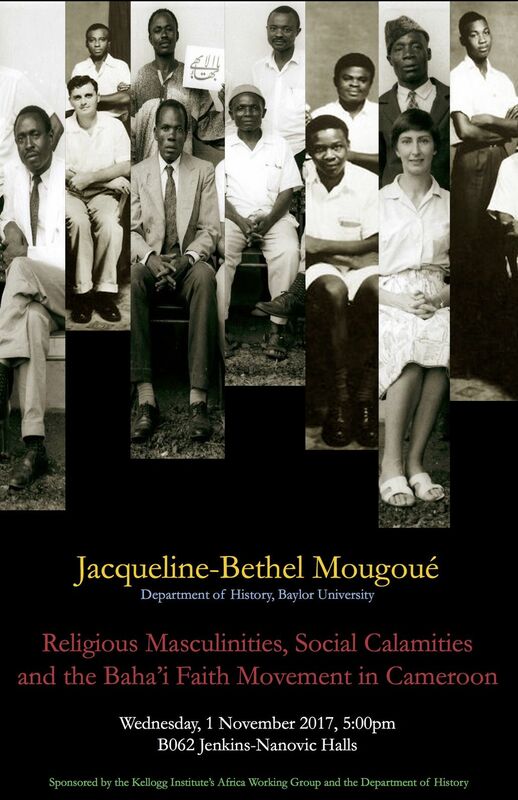 JACQUELINE-BETHEL MOUGOUÉ is an interdisciplinary feminist scholar of Africa who is particularly interested in how constructions of gender inform the comportment and performances of the body, religious beliefs, and political ideologies. Currently, she is an Assistant Professor of History at Baylor University. Mougoué’s first book, Gender, Separatist Politics and Embodied Nationalism in Cameroon is forthcoming with the University of Michigan Press in 2019. Mougoué is currently finalizing research on her second book, Manhood, Religion and Transcontinental Networks in Africa. The book will examine the history of the Bahá’í Faith and masculine identities in English-Speaking Cameroon from the 1950s to the 1980s. In summer 2019, Mougoué will be working on her second book project as a Visiting Research Fellow at the Moore Institute in NUI Galway (Republic of Ireland). Mougoué has been invited to give plenary talks on her research at various academic institutions including Paris Diderot University (France), University of Leuven (Belgium), University of Buea (Cameroon), Northwestern University (United States) and University of Notre Dame (United States). Mougoué received her M.A. and Ph.D. in history from Purdue University. She holds an additional degree from Purdue, a Graduate Certificate in Women’s, Gender, & Sexuality Studies (WGSS) from the WGSS Program.